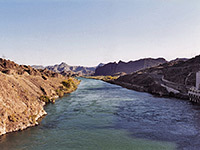 Lake Havasu, the southernmost of four large reservoirs on the Colorado River in Arizona, was formed in 1938 by completion of Parker Dam in a then uninhabited part of the Mojave Desert. The main function of the dam is to store water to supply two cross-country canals (the Central Arizona Project Aqueduct eastwards and the Colorado River Aqueduct to southern California), unlike the dams further north which are primarily designed for power generation. The lake now covers 35 miles of the river along the Arizona/California border and for much of its length is rather inaccessible, enclosed by sombre, rugged, roadless mountains, though highway 95 runs quite close to much of the eastern edge (see map below). Two towns provide various services: Parker at the south end, near the dam, and the larger Lake Havasu City, which was founded in 1963 by chainsaw engineer Robert McCulloch. The lake is popular with 'snowbirds' in winter - people from the north who come for the reliably mild weather (temperatures always in the 60s or 70s) - and with college students during spring break, but it is not a major tourist destination, partly due to the remote location, and because of the extremely hot weather in summer. The temperature usually exceeds 100°F for four months and can rise above 120°F (49°C). Nevertheless, the water is clean, the surroundings are scenic, and Lake Havasu City offers all necessary facilities for a vacation any time of year. As there are no major trails and only limited road access, the main recreation activities around the lake are fishing and boating rather than hiking or sight-seeing. Two towns provide lodging for visitors to the lake: Parker to the south and Lake Havasu City on the east side - follow the links for hotel maps, descriptions and reservations. Parker Dam may be inspected from the California side via a narrow, 15 mile road starting at Parker, or more easily from the west by a short road forking off AZ 95. The concrete arch dam is 320 feet high, though most is underwater, and indeed extends some distance below the river bed owing to the need to anchor the foundations to solid bedrock, which at this point is covered by a thick layer of sediment. 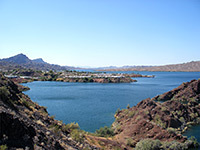 North of the dam and the nearby Havasu Springs resort, highway 95 runs right along the lakeshore for several miles, winding around the big inlet formed by Bill Williams River, and passing several overlooks that allow good, elevated views of the blue waters, framed by steep red-brown cliffs. After crossing the river, which at the confluence flows through a wide expanse of tall, grassy marshland, the road moves away from the lake and remains largely out of sight for 17 miles, until reaching Lake Havasu City. In this stretch there is only one main shoreline access point, at Cattail Cove State Park, whose facilities comprise a beach, 61 site campground, boat ramp, cafe and a short trail along the coast. 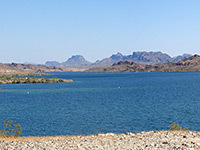 North of here, most of the shore and several miles of the hills bordering the lake are within the south section of Lake Havasu State Park, though access is limited to a few rough tracks. In contrast, the next 6 miles of the shoreline, around the city, are fully developed, with beaches, marinas, footpaths, piers, etc, but then the northernmost section (nearly as far as the I-40 crossing at Topock) are even more inaccessible, since highway 95 bends away eastwards. On the California side, only two places are reachable by a paved road - the small communities of Havasu Lake (16 miles east of US 95) and Black Meadow Landing (25 miles north of Parker). Most facilities in town are found along the main road (AZ 95), from a newly constructed mall near the north edge to the English Village shopping center on the south side, next to London Bridge. 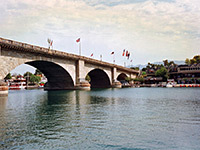 This famous stone structure, originally built in 1831 and imported from England in 1968, spans an artificial channel separating the mainland from a peninsula now known as Havasu Island, site of one of the city's four golf courses, and an air strip. The main Lake Havasu airport is several miles north, beyond the city limits. There are plenty of lakeside access points in the city, both paid (Lake Havasu State Park) and free, and no shortage of clean, sand or pebble beaches. This part of the lake is wide and the surrounding hills are fairly low so the land is not quite as scenic as the more mountainous terrain further south, but it is still pretty (see 360 degree panorama). The hills have a mixture of muted colors - black, grey, brown and red - but all are equally rugged and barren, and generally different to the larger scale but more uniform mountains in the desert further south in Arizona and California.